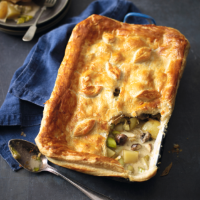 Gruyere and leeks are a fabulous combination in this warming and creamy pie recipe. 1. Preheat the oven to 200°C, gas mark 6. Parboil the potatoes for 5 minutes and drain. While the potatoes are boiling, heat the oil in a medium saucepan and gently sweat the leeks and mushrooms for 4-5 minutes until beginning to soften. 2. Stir through the creme fraiche and grated cheese, and add the parboiled potatoes. Season with a small pinch of salt and some black pepper. 3. Place the filling in a medium rectangular baking dish just a little smaller than the pastry sheet, and top with the sheet of puff pastry, cutting away any excess and pressing down the edges. 4. Brush all over with beaten egg and cut a hole in the top to allow steam to escape. Bake in the oven for 25-30 minutes or until golden and bubbling. To really impress, make a sweet decoration from the excess pastry and simply stick on with some beaten egg. This recipe was first published in October 2014.